Welcome to One Day at a Timer Support. 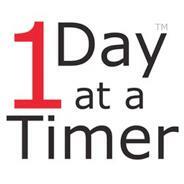 Below are some Frequently Asked Questions regarding the One Day at a Timer and its use. If you can’t find the answer you are seeking either on this page or under App Help then send us an email. We normally respond within a day or two after receiving your message. PLEASE NOTE: We have discovered a software bug when running version 1.1 of the One Day at a Timer under the latest iOS 4.2. (All earlier iOS versions are fine.) This bug relates to setting and using a password to protect your privacy. We recommend that you upgrade to version 1.2 which is now available in iTumes worldwide, this upgrade corrects this rather nasty bug. Thanks for your understanding. Is the One Day at a Timer available in other languages? Presently the application is available in English only. However we are working on adding nine other languages in the coming months. Why will One Day at a Timer app icon not display a Day Count over 10,000 properly? This is due to a limitation of the iPhone OS. Presently there is no solution for this. Perhaps the best thing in this case would be to turn OFF the Day Count Icon option under the Settings menu. Help! I‘ve forgotten my password. What can I do? If you have forgotten your password you must first delete the One Day at a Timer application from your device and then re-install it using iTunes. All of your data will be lost and you will have to re-enter your information after re-installing. Like all password protected applications this is done to ensure your privacy.